Jude and her twin brother, Noah, are incredibly close. At thirteen, isolated Noah draws constanly and is falling in love with the charismatic boy next door, while daredevil Jude cliff-dives and wears red-red lipstick and does the talking for both of them. But three years later, at sixteen, Jude and Noah are barely speaking. Something has happened to wreck the twins in different and dramatic ways...until Jude meets a cocky, broken, beautiful boy, as well as someone else-an even more unpredictable new focus in her life. The early years are Noah's story to tell. The later years are Jude's. What the twins don't realize is that they each have only half the story, and if they could just find their way back to each other, they'd have a chance to remake their world. - excerpt from book. 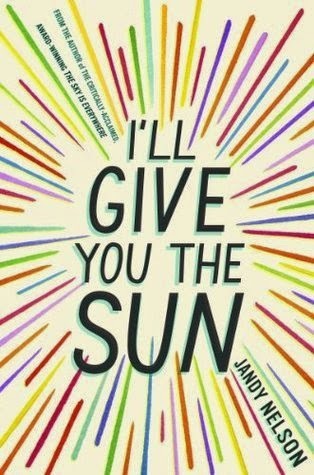 I'll give you the sun by Jandy Nelson is a book about two siblings that had an incident occured in their lives that changed everything and who they are. At first I thought the book was at an okay pace and when the plot thickens it was hard to put down. I enjoyed every bit of the book and I loved the meaning conveyed by the book. I like the dual perspective written where the boy's in the past and sister in the present. I find myself enjoying the sister's part of the chapters more. I really like the characters of the book, especially the sister because she had the most character growth compared to the brother. The other characters involved in the plot are also good to the story and I like how these people can be so real. I feel like if I talked too much about the book, I would reveal the contents but honestly it was easy to guess what was coming or what information was hidden from the characters. It was a predictable book for me but I still loved it because it was how the plot all come together at the end that was beautiful. How the thoughts of the main characters were written in the chapters were also really good and the description was creative. Overall it was a good book about two siblings and I loved that I can somehow relate a little bit to it. The message of the book was beautiful and I hope the people who read this gets the same feelings too. It's not the type of book that I would read again quickly, probably when I can't remember well then I would pick it up. But now the story and feelings are fresh in my mind, it would be boring to read a book that I know so much about now. A good page turner that I will recommend to contemporary lovers and people who love to read stories involving sibling love. Below is something said by the sister which I absolutely agree with and I thought it was good enough to share and remember it. "Or maybe a person is just made up of a lot of people," I say. "Maybe we're accumulating these new selves all the time." Hauling them in as we make choices, good and bad, as we screw up, step up, lose our minds, find our minds, fall apart, fall in love, as we grieve, grow, retreat from the world, dive into the world, as we make things, as we break things.- pg 354, line 17 onwards. Gwen's life has been a roller coaster since she discovered she was the Ruby, the final member of the time-traveling Circle of Twelve. When not searching through history for the other time travelers and asking for a bit of their blood (gross! ), she's been trying to figure out what all the mysteries and prophecies surrounding the Circle really mean. It's not easy when a secret society, a dangerous Count, and her own time-traveling partner, Gideon, are determined to keep her from the truth. Especially since Gwen can't decide whether Gideon really believes she's a traitor to the Circle or might actually be on her side - and creeping into her heart. -excerpt from book. 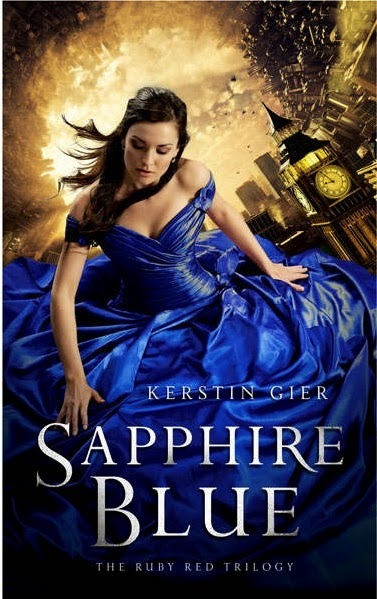 Sapphire Blue by Kerstin Gier is the second book to the ruby red trilogy. The stories continues where we're left off from the first book without any time gaps. I absolutely loved this book from start till the end, it was really exciting to read about Gwen's adventure. Two new characters were introduced into the story and I really love those characters. One of the characters made the book funny while another was one who adds to the mystery of the plot. As for the main characters, I think there was much growth for Gwen and it's interesting to see her actions through out the book. I also like the interactions between all the characters especially Gwen and her friends. 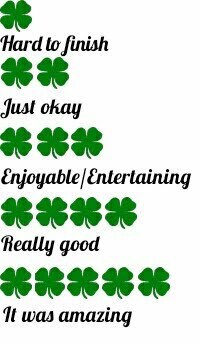 For the plot of the book, it had a very good pace and the timing of everything happening in the book is perfect for me. I have yet to see how the incidents link together which I think will be written in the last book. Much of the mystery still remains for the story and I guess that is what keeps me reading because I wanted to know more. So far there are no flaws presented in the book and for me it is a good sign for the direction of the book. In conclusion, I loved reading this book and I had a hard time putting it down. The story captures your attention well because more mysteries present itself in the book. When I was reading, I just wanted to find out what else will happen and what Gwen will find out for herself. Besides that, I had to read more to see whether some incident that happened in the first book will have reasons/explanations in the second book. This book kept me at my toes and I'm really looking forward to the last book. This book definitely is better than the first book as it has more incidents for the story. If you read the first, this is not to be missed. I highly recommend to people who love to read about time travel because so far this book has not made any flaws yet. I was so happy to finally see this game translated into English version, Bonbon Cakery. It's another free game offered by Kairosoft but of course they will always find other ways to earn just like Beastie Bay and Dream House Days. You just need to spend more time than those who are willing to pay to buy in-game items because it just comes slower. The in-game items are premium tickets and medals, just like the previous two free games which helps leveling up ingredients, staff and others in the game. What you find similar (Cafe Nipponica, Sushi Spinnery) in this game is that you will need to experiment with base and ingredients to unlock new recipes. Those new recipes will give you more choices to sell in your bakery. The need to sell various things in your bakery is because it appeals to different customers where they level up and unlock things such as ingredients, promotions and etc to progress your game. Games like Hot Spring Story, World Cruise Story and many more have to level up their customers and this game is no exception. 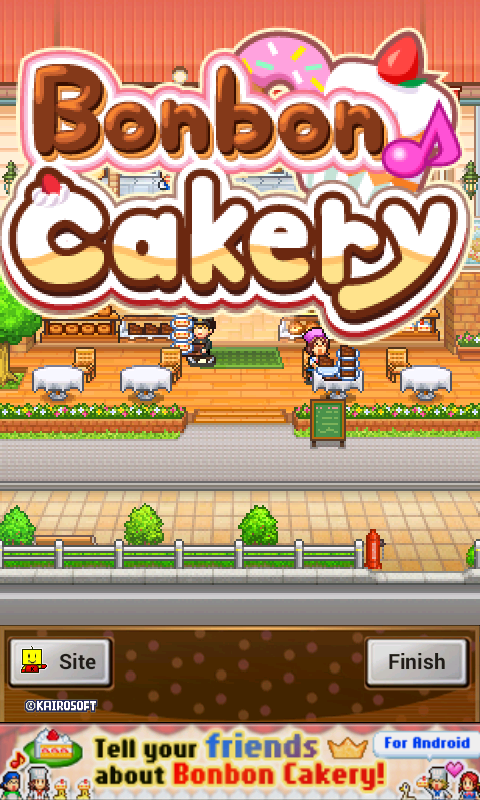 Bonbon Cakery certainly has all the same elements/game play that every other Kairosoft game usually have which means you must spend many hours on. "Although I had never seen him before, I recognized him immediately. I'd have known his voice anywhere. This was the guy I'd seen on my last journey back in time. Or more precisely, the one who kissed my doppelgänger whule I was hiding behind the curtain in disbelief." Sixteen year old Gwen lives with her extended - and rather eccentric - family in an exclusive London neighborhood. In spite of her ancestor's peculiar history, she's had a relatively normal life so far. The time-traveling gene that runs like a secret thread through the female half of the family is supposed to have skipped over Gwen, so she hasn't been introduced to "the mysteries", and can spend her time hanging out with her best friend, Lesley. It comes as an unwelcome surprise when she starts taking sudden, uncontrolled leaps into the past. She's totally unprepared for time travel, not to mention all that comes with it: fancy clothes. archaic manners, a mysterious secret society, and Gideon, her time-traveling counterpart. He's obnoxious, a know-it-all, and possibly the best-looking guy she's seen in any century.... -excerpt from book. 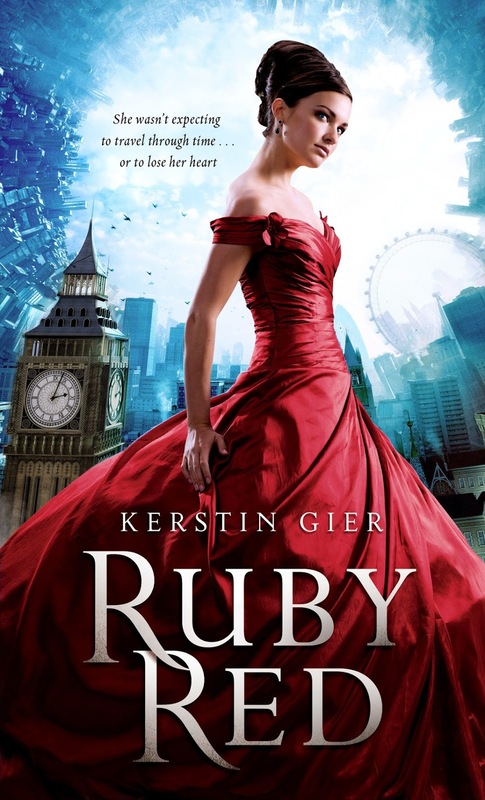 Ruby Red by Kerstin Gier is about a young girl who discovered she could time travel just like her ancestors. Firstly I went into the book only knowing that time traveling was involved which is one of the topics that intrigued me the most. When this type of topic is touched, the author must be really good at plotting every event down, butterfly effects and how everything links in the end. I really enjoyed this book as the plot is really good, mysterious and much turn of events here and there. I didn't expect anything and I guess that's what made the book good. I also could not predict much of the story. Books that I can predict are not fun to read anymore and it bores me easily. The characters of the book were so suitable for the story and I think having a female heroine like that made the story even better. The side characters of the book are also perfect for the story, especially the best friend of the heroine. I can't wait to read more about the people around her and their roles in the story itself. The male hero of the book is also full of mystery and hard to predict which makes things interesting. This was a book that was hard to put down, when I read the prologue my attention was immediately captured. The flow of the book was very good, you can say this is an introductory to the whole trilogy but important events did happen which I'm sure contribute to many other events in the other two books. As a first book to the trilogy, I think it was well written and it definitely is enough to make people want more, The epilogues of the book is one of the major parts that will make people continue to the next book.